I posted a month ago, about this really great garage sale that I had gone to. The lady had great furniture at great prices. If you remember, I bought my daughter a coffee table that she liked. It is similar to the one I have. I also bought a rustic table for $5, and a sideboard, and this dresser for $25. Here is the dresser now. I sanded and primed, painted an undercoat of an apricot color and a top coat of a robins egg blue. I sanded again, and added the glass knobs to the top drawer, and voila new and improved dresser!! Here is the ugly before dresser. It was an awful shade of black, with scratches and dings. Not the shabby chic kind either. The new and improved dresser now matches my nightstands in my bedroom. I painted them the same way. Anyway, I am happy with the results. I am trading out an old Victorian dresser that I have had for about 20 years. I wanted a little change. All we have to do, is move the old one out, and the new one in. I hope you all have a wonderful Labor Day Weekend!!! First I want to talk about my friend Margo. We have never met in person, but I feel like I know her through emails, her blog, and website. She is an amazing trash to treasure artist. She makes wonderful things out of junk and flea market finds. Margo lives in Texas. I met her through the HGTV boards. Sharing our trash to treasure pictures and stories. 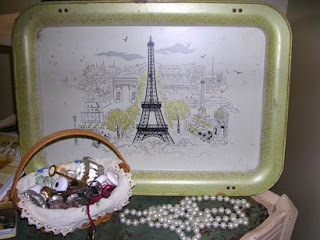 The really cute Eiffel Tower tray you see, is for sale on her website. She has great stuff for sale, including some wonderful jewelry, so please visit her site soon. www.robomargo.com/store Also be sure to visit her blog. http://robolady.blogspot.com/ You will love her ideas. I thought you might like to see my little supply cupboard. This is what I sit next to when I am on the computer. I have it stocked with many of my art supplies, and fun things from some of my fellow bloggers. I find it interesting to see where people create and work. I really enjoy my supply cupboard, and as some of you remember, it was my $10 garage sale redo. I hope you are all having a great day!! Cones, Cones And More Cones!! Just wanted to show you all of the cones, I have been making, and buying. On Saturday, I received a beautiful package, I ordered from Lidy, at the French Garden House. I got some French Baptism Favor Cones, just because they are so cute. Andrea had some, at 100 wishes, and they sold out in 2.8 seconds. I also got a beautiful Christmas cone too. I thought it would be fun, and different to buy one for myself, instead of making it. September 1. That way I can enjoy my decorations for awhile, and so can you. I will post a big, Halloween extravaganza for you soon. In other news, the wedding invitations went out today. YAY!! I had no idea the work they entailed. We wanted them hand canceled, so the Post Office lady, let me do it myself. (Who knew)?? Here is my latest Halloween craft. I made this cone, using a vintage Halloween image. I have been having some fun, in between helping my daughter. Although tonight, we are working on wedding invitations. I already did the hand calligraphy on them, but now they need stamping, stuffing, and sealing wax. It is a process. I also found this cute Halloween cat, at Garden Memories. I have mentioned before, it is the cutest shop in Ventura. I couldn't help myself. I had to have him. Barbara, the owner of the shop said, that she had just gotten them in, and there were only 3 left. So of course I had to get one. He is a replica of a vintage cat. Here is my other little project. I made my daughter this journal, for her honeymoon. You probably can't tell from the picture, but I used a map of the places they will be visiting in Italy. It was a map from, Cavallini Papers. Well, that is some of what I have been up to lately. Hope you are having a great Thursday night! I hope you are all having a good Tuesday. Just wanted to update you, on what I have been doing at my daughter's new house. So far I have done a Venetian plaster treatment, on the fireplace. As you can see, it was a bright white before. I put a tanish green plaster, on top of the white. It warmed it right up. I also finished painting a guest bath. It is kind of an olive color. I did the woodwork, and cabinets in Swiss Coffee. It looks so much better than it did. I have been planting flowers, and did a stain on her front porch. I will try to get more pictures soon. Halloween is a favorite holiday of mine. I collect vintage Halloween items. I have always been fascinated with all things Halloween. My daughter has inherited this fascination, as well. I am planning on showing you a lot more, as the holiday approaches. I also wanted to show you this adorable tee shirt, I received in the mail yesterday. It is from Heather Bullard's Present Past Collection, website. If you haven't yet looked at her shop, you must right away. She has wonderful things. Including a silver key charm like the one on the back of this tee shirt. I gave it to my daughter last night, and she absolutely loves it. Not to mention, Heather has wonderful taste, and wraps everything so beautifully. http://www.thepresentpast.com/ If you go to Jamie's blog Simply Me Art http://simplymeart.blogspot.com/, she also mentions Heather today. Have a wonderful Friday, and weekend!!! Views From My Daughter's First House! Here is what I have been doing for the last 5 days. I have been helping my daughter Amanda, and her fiance Joe move, into their new home. They moved out of their town home, and into their first house. They are very excited about the move. Their house was in move in shape, but it's a blank slate, to do as they please. They are happy to be in, and getting settled before their wedding, in October. Chessie the cat is up above, checking out the painting supplies. They have a nice big yard, with a fire pit. That is my old patio set. Amanda just added a new umbrella. It looks so pretty at night. Under the umbrella, there are solar twinkle lights. Max, is the largest cat that I have seen. You can't tell from the picture, but he is like a little bear. The other two cats, Sophie and Chloe are hiding somewhere. There is a lot of work to do, but it is going to be nice and cozy very soon. I'm sure this is the first of many tours. I will definitely, show you more pictures, as the projects get done. As you all know from my last post, we were busy all weekend, helping our daughter and her fiance Joe, move into their new home. So far I have planted some flowers, carried, lifted, added shelf paper to the many, many cupboards etc. It is a lot of fun, but very exhausting. We are really excited, they were able to get into a house before the wedding. 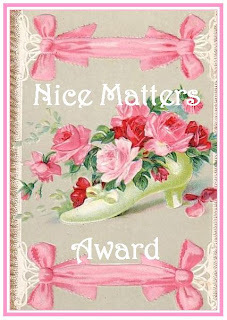 While I was away from my blog, I was nominated again for the Nice Matters Award! I am very flattered, Kate. I try to be as nice as possible. I am suppose to nominate 7 more of you. That is a very hard thing to do. I think that every last one of you, are soooo nice. I enjoy all of you. I love reading about you, and your lives. Just the way you talk about your families, hobbies, and lives. I nominate all of you today, for the Nice Matters Award. Now I am off to be, nice again. I will be waiting for the Cable guy this morning, painting and planting, and cleaning. Both my daughter Amanda, and Joe aka, fiance have to be at work today. So I will be performing my good deeds!! I will bring my camera along today. Congrats to Jamie, of Simply Me Art!!! My husband Mark, drew her name for me, this morning. I will be helping my daughter and her fiance, move into their new home this weekend. Tussie Mussies, Eggs and Wishes, Oh My!!! Here is the tussie mussie, that I received just the other day, from my swap partner Carrie. Carrie's blog is the Paper Butterfly. I was thrilled to receive this lovely work of art. She filled it with all kinds of treasures. I'm sure I will be using some in my next art project. Thank you so much Carrie!!!!! You outdid yourself! Today was like Christmas. I just received my order from Andrea, at 100 Wishes. I think my wish was granted. Look at the beautiful wrappings, and the attention to detail. Not to mention the yummy bubble gum lolly pop she included. Every ribbon, tag and piece of paper is a thing of beauty. Thanks so much Andrea! I will be shopping again soon! If that wasn't enough, I received my egg order from Amy, at Poppy and Ivy. Amy has a lovely blog. She sells some great items, like these really cute eggs. ( I can't seem to get enough nests, and eggs). That is what has been going on around here, since my last post. I can't wait to get started, playing with all of my new things. If you haven't yet left a comment on my previous post, please do, so I can enter your name in my giveaway. You have until Friday. That is when we will be choosing the winner! I can't believe this is my 50Th post already!! In the trend that I see happening, I will be having a little blogging giveaway. YAY! B on Main. It is really cute and sparkly. Made with German glass glitter. Just leave a comment, and I will enter you in my little giveaway. 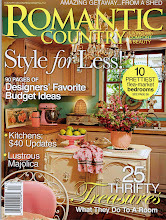 Leave me your blog info and or email info, so I can get a hold of you, when you win. I will draw a name on Friday. Good Luck!! Now on to the Friday night pizza extravaganza!! Here is a picture of our neighbors Mike and Bruce. We were laughing about the fact, they both had almost identical shirts on. Up above is my friend Joan, with her husband Bill, next to my husband Mark. Joan is my walking buddy. We have know each other for about 21 years, since our kids were in kindergarten. Here are some pictures before, and during the party. I realized afterwards, I never took any pictures of the pizzas. Well, I was running around so much, and working so hard to get all of the pizzas done, I forgot to take pictures. Take my word for it though, the pizzas were a big hit. Everyone enjoyed them. We had a lot of fun. I had a little trouble working with the dough, because of the humid day we were having. But it all worked out in the end. The next night, we went to a concert in the park. We saw Steve Tyrell. (Guess what we brought for our picnic)?? Steve Tyrell was really great!! He is so entertaining. He sings standards, and Frank Sinatra. He has a really good band too. Remember to leave a comment, to be entered into my giveaway.